FISTS clenched and toes curled, we held on with all our might as we weaved, ducked and flew through the corridors lining the Great Wall of China. But this was not a trip to one of the Seven Wonders of the World - this was a wild ride in the 7D Cinema experience, a new Mooloolaba tourist attraction. 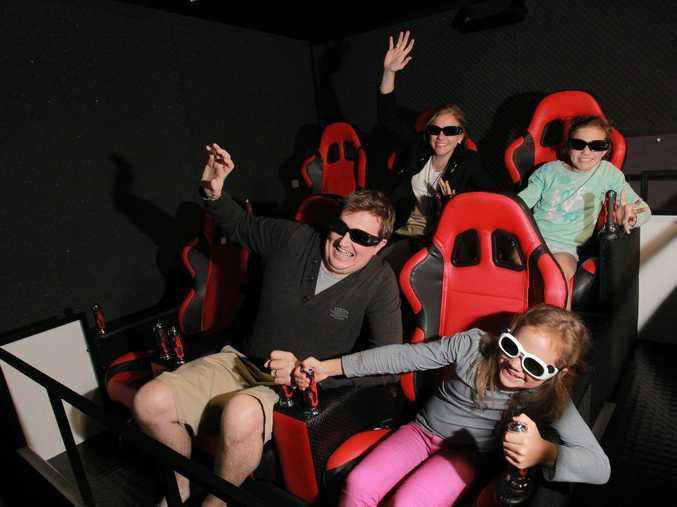 7D Cinema combines the latest in virtual reality technology with high-tech rollercoaster movements and special effects such as snow, rain and wind. But thankfully, it was all in the comfort of the body-hugging Ferrari-style seats on a simulator platform seating six people. The 7D Cinema on Mooloolaba Esp is the third in Australia for business partners Michael Kurt and Halit Kaymak, who also own 7D Cinema on the Gold Coast glitter strip. The Mooloolaba cinema has been attracting attention since opening last week. Crowds are asking "what is 7D?" Snapping on the seatbelt and slipping on the battery-powered 3D glasses I wasn't sure what to expect. I'm not a huge fan of rides, so I scanned the movie list and stuck with the most popular and less intense movie option of Wall of China. The film started with bubbles floating past our eyes and before I had time to pop just a few, we were off, as the simulator platform moved and turned with every twist of the road on the giant screen in front of us. The 3D dragon swirled past our feet and a sweet aroma filled the room as we charged through a row of flowering trees. This scaredy-cat turned into a 7D fan when the sights, sounds, touch and smell stimulated all the senses. The simulator is a unique concept for Australia, with the ability to generate drops and create that lower-belly rollercoaster feeling. And the room is soundproof, so scream away. Mooloolaba 7D Cinema manager Sylvia Kelm said the business had thrillseekers stepping on to the platform. "It's just really great fun for everyone," Ms Kelm said. "We like to think we bring something different to the esplanade other than food or clothing. "We have eight different movies, from Space Coaster for the younger kids to the horror movie Panic House. "It's not just a movie, it's an experience." 7D Cinema Mooloolaba is open from 10am-10pm and no bookings are necessary. Movies run for eight minutes. The cost is $15 for adults and $13 for students.